How do we create designs that foster a sense of community? We previously shared thoughts on this topic in Environments for Living, and are continuing the conversation to help owners, operators and designers stay up-to-date with the latest community-building trends in interior design. To start, think of public or private spaces that encourage social interaction in everyday life; these are usually dining rooms and restaurants, gyms, hair salons, a family room, playgrounds, etc. Aspects of these typical areas for socialization must be in mind when designing in a manner appealing to residents, but also to the entire family, for all to enjoy time for socializing and connecting. As a society, we are living longer. According to the data from the U.S. Census Bureau and the National Investment Center for the Seniors Housing & Care Industry (NIC) approximately 19 million people—were aged 75 years or older, and that number is expected to grow steadily over the next decade, and then accelerate as the baby boomer generation progresses in retirement. 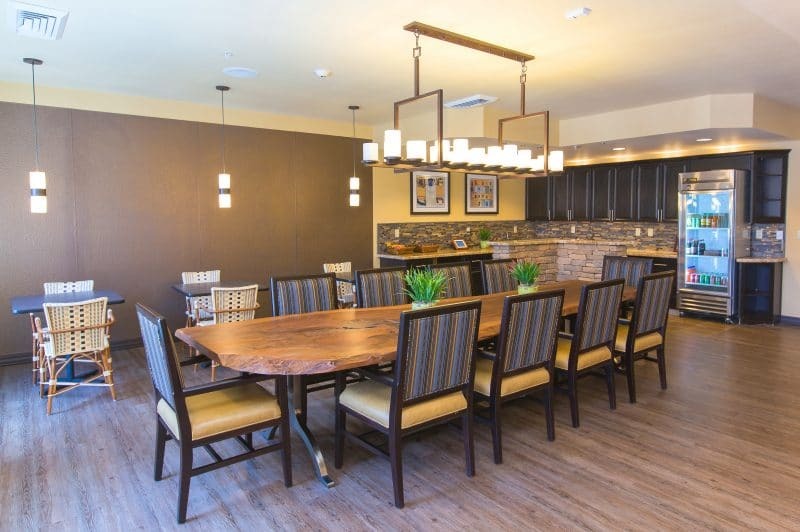 This means that communities that are designed modern, and leaning more toward hospitality and connection are going to be more critical than ever when residents are deciding their choice in a senior living home. Does it feel like home? If the answer is no, how can we make it feel like home? For example, think about a child visiting his/her grandparents’ home. What would be there? Perhaps an area with toys, crayons, video games or books. By adding a room to full of toys, activities, and even a Wii gaming console creates a space where families with children can engage naturally and spend an enjoyable visit. We want the entire family to enjoy the home, not just the resident. In community gathering spaces, make it easier to people to connect one-on-one or in small groups. For example, designing smaller, private dining opportunities can be achieved by carving out space for a private dining room, or booths with two-top or four-top tables. This results in areas that feel authentic and special even if they’re part of a larger dining setting. Creating “tech rooms” where residents can read the paper, check their stocks, respond to emails, work on computer skills, (or maybe even go on social media sites!) is essential in designing for flexible spaces. These kinds of rooms happen in your own home, or at local coffee shops, and are an important feature to design for in a senior living home to maintain that sense of normal community engagement. It’s important to remember when designing for social connection in senior living to keep it a transitional design. Using colors that have longevity and won’t appear dated in a short amount of time. You don’t want anything too modern and hip in design because it can be hard for communities to remodel on a regular basis. It’s our goal to continue staying updated on the top trends in senior interior design services for your senior living communities. We’d love to answer any questions you may have!